^ 1.0 1.1 1.2 1.3 1.4 1.5 1.6 1.7 1.8 姜公韜. 〈第五章：明清之際〉. 《中國通史·明清史》. : 第76–82頁. ^ 史景遷. 〈2 滿清的綏服〉. 《追尋現代中國——最後的王朝》. : 29. ^ 中国少数民族语言满语濒临消失. 新华网. 2013-09-23 [2016-06-11]. 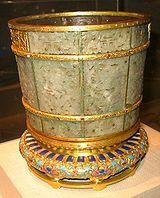 ^ Turchin, Peter; Adams, Jonathan M.; Hall, Thomas D. East-West Orientation of Historical Empires (PDF). Journal of world-systems research. December 2006, 12 (2): 219–229 [2010-08-12]. ISSN 1076-156X. （原始内容 (PDF)存档于2007-02-22）. ^ 6.0 6.1 李國祁. 《中國歷史》. 三民出版社. ISBN 9787108015464. ^ 安双成 (编). 《满汉大辞典》. 辽宁民族出版社. 1993年: 第654页. ^ BabelStone : Seals : Precious Seals of the Qing Dynasty. BabelStone. [2016-09-02]. ^ 张晓明. 中国家具. 剑桥大学出版社. 2011: 22. ISBN 9780521186469. ^ 刘小萌. 《清代八旗子弟》. 辽宁民族出版社. 2008年: 第206页. ^ 周敏（鲁东大学历史与社会学院）. 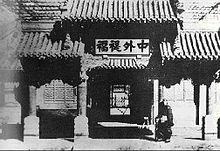 《首崇满洲——清朝的民族本位思想》. 《沧桑》. 2008年. ^ 錢穆. 〈第五講 清代〉. 《中國歷代政治得失》. ^ 15.0 15.1 梁啟超. 《清代學術概論》. 上海古籍出版社. 2000年. ^ 陳其泰 等. 《中国学术通史》 （清代卷）. 人民出版社. 2004年. ^ 22.00 22.01 22.02 22.03 22.04 22.05 22.06 22.07 22.08 22.09 22.10 22.11 22.12 22.13 22.14 22.15 22.16 22.17 22.18 22.19 《中國文明史 清代前朝》. ^ 25.0 25.1 25.2 姜公韜. 〈第七章：五百年社會文化的掠影〉. 《中國通史·明清史》. : 第120頁. ^ 26.0 26.1 26.2 26.3 26.4 26.5 26.6 姜公韜. 〈第七章：五百年社會文化的掠影〉. 《中國通史·明清史》. : 第147–153頁. ^ 徐俊. 中國古代王朝和政權名號探源. 湖北武昌: 華中師範大學出版社. 2000年11月: 308–313. ISBN 7-5622-2277-0 （中文）. ^ 张世明. 传统考据与跨语际分析：对一个世纪性学术争论问题的求解私见. 北京: 中国人民大学清史研究所 （中文）. ^ 徐俊. 中国古代王朝和政权名号探源. 湖北武昌: 华中师范大学出版社. 2000年11月: 27. ISBN 7-5622-2277-0 （中文）. ^ Zhao, Gang. 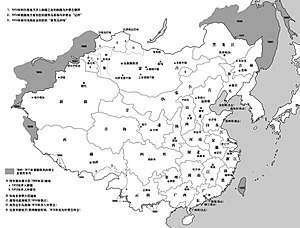 Reinventing China: Imperial Qing Ideology and the Rise of Modern Chinese National Identity in the Early Twentieth Century 32 (Number 1). Sage Publications. January 2006 [23 May 2014]. JSTOR 20062627. doi:10.1177/0097700405282349. （原始内容存档 (PDF)于25 March 2014）. ^ 史景遷. 〈2 滿清的綏服〉. 《追尋現代中國——最後的王朝》. : 第37頁. ^ 41.0 41.1 41.2 41.3 41.4 41.5 姜公韜. 〈第五章：明清之際〉. 《中國通史·明清史》. : 第87–96頁. ^ 史景遷. 〈3 康熙政權的鞏固〉. 《追尋現代中國——最後的王朝》. : 第51頁. ^ 暴行之二：平三藩屠杀平民. 凤凰网. [2015-01-09] （中文）. ^ 48.00 48.01 48.02 48.03 48.04 48.05 48.06 48.07 48.08 48.09 48.10 姜公韜. 〈第六章：清朝的極盛與中衰〉. 《中國通史·明清史》. : 第104–112頁. ^ 53.0 53.1 53.2 姜公韜. 〈第六章：清朝的極盛與中衰〉. 《中國通史·明清史》. : 第109頁. ^ 喻大华. 《清代文字狱新论》. 《辽宁师范大学学报：社科版》. 1996年, (1996年01期): 第72頁. ^ 60.0 60.1 60.2 许明龙. 《欧洲十八世纪中国热》. 山西教育出版社. 2007. ISBN 9787560062969. ^ James I. Wong. 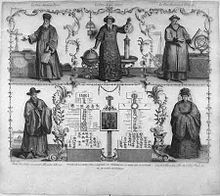 Chinoiserie and Sinophilism in the 17th- and 18th-century Europe（《17至18世紀歐洲的中國風和中國熱》）. Koinonia Productions. 1984. ^ ［美］William Worthen Appleton. 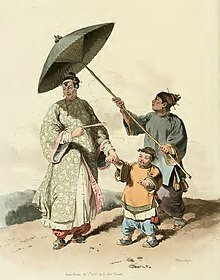 A Cycle of Cathay: The Chinese vogue in England during the seventeenth and eighteenth centuries（《17至18世紀英國的中國熱》）. 哥倫比亞大學出版社. 1951. ^ 64.0 64.1 ［法］佩雷菲特. 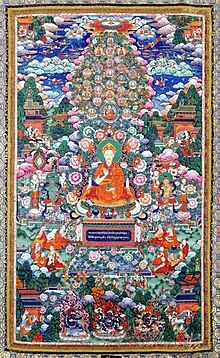 ，停滯的帝國：兩個世界的撞擊》. 王國卿 等 譯. 台北: 生活‧讀書‧新知三聯書店. 1993. ISBN 9787108026934. ^ Barrow, J (1807). Some Account of the Public Life, and a Selection from the Unpublished Writings, of the Earl of Macartney, London. : "Indeed the machinery and authority of the Chinese government are so organized, and so powerful, as almost immediately to surmount every difficulty, and to produce every effect that human strength can accomplish." ^ 68.0 68.1 68.2 68.3 68.4 68.5 68.6 68.7 68.8 姜公韜. 〈第六章：清朝的極盛與中衰〉. 《中國通史·明清史》. : 第113–115頁. ^ 董全军. 从民变看清王朝灭亡及历史启示. 《齐齐哈尔大学学报（哲学社会科学版）》. 2010年. ^ [美] 羅茲‧墨菲. 《亞洲史》. 黃磷 譯 第4版. 海南出版社/三環出版社. 2004年10月: 369–371/452–453. ISBN 7-80700-092-9. ^ 78.0 78.1 78.2 78.3 史景遷. 〈7 與西方世界的初次衝突〉. 《追尋現代中國－最後的王朝》. : 第182頁－第200頁. ^ 79.0 79.1 79.2 史景遷. 〈8 內部危機〉. 《追尋現代中國——最後的王朝》. : 第211頁. ^ 80.0 80.1 80.2 80.3 史景遷. 〈9 改革的中興之治〉. 《追尋現代中國——最後的王朝》. : 第239頁－第269頁. ^ 83.0 83.1 83.2 83.3 83.4 83.5 83.6 83.7 83.8 史景遷. 〈10 晚清的新動亂〉. 《追尋現代中國——最後的王朝》. : 第273頁－第291頁. ^ 羅家倫. 〈興中會成立日期之史的考訂〉. 《中山先生行誼》下冊 1995年10月初版）. 臺灣書局. ^ 85.0 85.1 史景遷. 〈11 清廷的覆沒〉. 《追尋現代中國——最後的王朝》. : 第303頁－第323頁. ^ 李雲漢. 〈第六章 民國初年的政治與外交〉. 《中國近代史》. : 第258頁. ^ Geoffrey C. Gunn. Wartime Macau: Under the Japanese Shadow. 香港大學出版社. 2016: 28. ISBN 978-988-8390-51-9. ^ 90.0 90.1 《清史稿‧志二十九　地理一》. 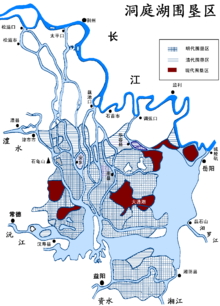 ^ 98.0 98.1 98.2 98.3 98.4 98.5 《清史稿‧志五十一、五十二、五十三 地理志二十三、二十四、二十五》. ^ 106.0 106.1 106.2 106.3 杨念群. 《超越“汉化论”与“满洲特性论”：清史研究能否走出第三条道路？》. 《中国人民大学学报》. 2011, (2). ^ 118.0 118.1 118.2 118.3 中山八郎. 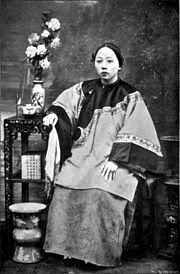 《明末女真和八旗素描》. 《满洲史研究》. 东京: 四海书房. 1926年. ^ 郭廷以. 《近代中國史綱》上冊 中文大學出版社. : 第104頁. ^ 费正清、刘广京. 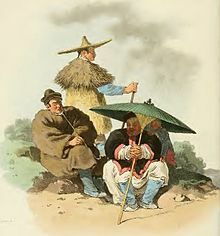 《剑桥中国晚清史（1800-1911）·下卷》. : 第200–201页. ^ 费正清、刘广京. 《剑桥中国晚清史·下卷》. : 第378–379页. ^ 费正清，刘广京. 《剑桥中国晚清史·下卷》. : 第534页. ^ “李－阿舰队”舰船资料. 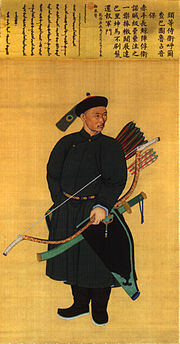 北洋水师. [2010-08-24]. （原始内容存档于2010-08-21）. ^ 恬吉. 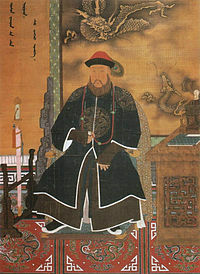 北洋水师. [2010-08-19]. （原始内容存档于2010-07-06）. 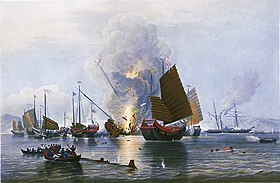 ^ 长沙晚报：海军青岛阅兵更增航母情结. 中新网. 2009-04-24 [2010-08-24]. ^ 甲午戰後重建海軍與八國聯軍之役. 中国军舰博物馆. [2010-08-29]. （原始内容存档于2008-12-12）. ^ 139.0 139.1 139.2 魏斐德. 《洪業：滿清外來政權如何君臨中國》. 陳蘇鎮 等 譯. 台北: 時英出版社. 2003: 689頁－747頁. ^ ［法］佩雷菲特. 《停滯的帝國：兩個世界的撞擊》. 王國卿 等 譯. 台北: 生活‧讀書‧新知三聯書店. 1993. ISBN 9787108026934. ^ ［日］吉田順一. 〈北亞的歷史發展與魏復古的征服王朝理論〉 (Thesis). 鄭欽仁 譯. ^ 周敏（鲁东大学历史与社会学院）. 《首崇满洲——清朝的民族本位思想》. 《沧桑》. 2008年, (2008年第05期). ^ 赵尔巽等. 《清史稿》第12册. 中华书局. 1976年: 卷114，第3265—3266页；卷110，第3213—3214页. ^ 安双成. 《清代养育兵的初建》. 《历史档案》. 1991年, (1991年04期). ^ 李喜林. 《清代的柳条边》. 《兰台世界》. 1994年, (1999年第04期). ^ 張崑將 (编). 東亞視域中的「中華」意識. 國立臺灣大學出版中心. 2017: 86-101. ISBN 9789860521665. ^ 曾国庆. 論駐藏大臣對治理西藏的影響. 中国藏学. （原始内容存档于2017年10月10日）. ^ ［英］约·罗伯茨 编著. 《十九世纪西方人眼中的中国》. 蒋重跃、刘林海 译. 北京: 时事出版社. 1999年: 第21–22頁. ^ 柳诒徵. 《中国文化史》下册. 中国大百科全书出版社. : 第731頁. ^ 《中國大百科全書·中國歷史III》. 中國大百科全書出版社. 1992: 1222頁. ^ 史景遷. 〈6 中國與十八世紀的社會〉. 《追尋現代中國－最後的王朝》. : 第129頁. ^ 史景遷. 〈6 中國與十八世紀的社會〉. 《追尋現代中國－最後的王朝》. : 第131頁. ^ ［美］Arnold H. Rowbotham. Voltaire, Sinophile（伏爾泰與中國熱）. 1932. ^ ［英］John Barrow. Some Account of the Public Life, and a Selection from the Unpublished Writings, of the Earl of Macartney. London. 1807: 178–188, 416–422. ^ 薛福成. 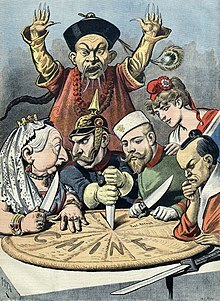 《出使英法義比四國日記》光緒十六年（1890年）5月11日： 「又查舊卷，英外部於丁亥年（1887年）咨送兵部尚書節略， 詢及中國國樂樂譜，以備兵丁譜奏之用。前任劉大臣照復云：「查中國樂章，譯為歐洲宮商， 可合泰西樂器之用者，僅有一闕，名曰《普天樂》。相應將樂譜一冊，備文照送查收。」，按《普天樂》者，曾侯（曾紀澤）所制也。」. ^ 葛劍雄. 《中國人口發展史》. 福建人民出版社. 1991年: 第263頁. ^ 205.0 205.1 205.2 205.3 205.4 205.5 205.6 205.7 姜公韜. 〈第七章：五百年社會文化的掠影〉. 《中國通史·明清史》. : 第122頁. ^ Rowe, William T. "Social stability and social change". Cambridge, MA: Harvard University Press. 2002: 473–562. ISBN 978-0-674-03612-3. ^ Thomas E. Ewing. “Ch’ing Policies in Outer Mongolia, 1900-1911”. Modern Asian Studies. 1980, 14 (1): 152. ^ Sharad K. Soni. 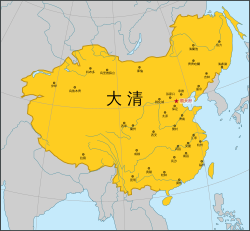 Looking Back to History: Inner Mongolia under Qing Rule 16 (5): 32-53. ^ 莊吉發. 《清世宗與賦役制度的改革》. 學生書局. 1985年: 第69頁. ^ 張研. 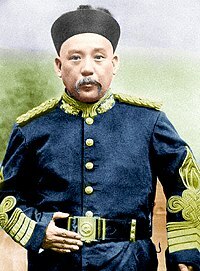 《清代經濟簡史》. 雲龍出版社. 2002: 484. ISBN 9789867938107. ^ 莊吉發. 乾隆五年十二月丙辰，御史蘇霖渤奏. 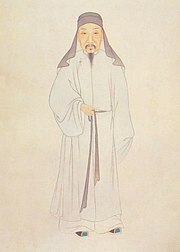 《清高宗純皇帝實錄‧卷133》. 學生書局. : 第5頁. ^ 葛劍雄. 《中國人口發展史》. 福建人民出版社. 1991年: 第63頁. ^ 郝延平、魏秀梅 (编). 《近世中國之傳統與蛻變：劉廣京院士七十五歲祝壽論文集》. 臺北: 中央研究院近代史研究所. 1998: 259-281. ^ 高王凌. 〈明清時期的中國人口〉. 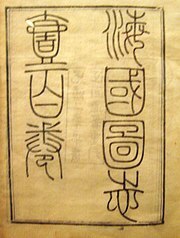 《清史研究》 (福建人民出版社). 1994年, (1994年第3期): 第29頁. ^ 葛劍雄. 《中國人口發展史》. 福建人民出版社. 1991年: 第249頁. ^ 何炳棣. 《1368〜1953中國人口研究》. 葛劍雄 譯. 上海古籍出版社. 1989年: 第268頁. ^ 梁方仲. 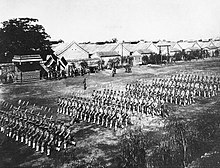 甲表86《清宣统年间调查（公元1912年汇造）之户口数的修正》. 《中国历代户口、田地、 田赋统计》. ^ 222.0 222.1 杨涌泉. 《中国十大商帮探秘》. 企业管理出版社. ^ Maddison, Angus. Contours of the World Economy, 1–2030 AD. Essays in Macro-Economic History. Oxford University Press. 2007: 379, table A.4.M. ISBN 978-0-19-922721-1. ^ 1820年清朝GDP第一靠谱吗 专家：源于大胆估测. [2015-07-30]. （原始内容存档于2017-07-11） （中文）. ^ 刘逖. 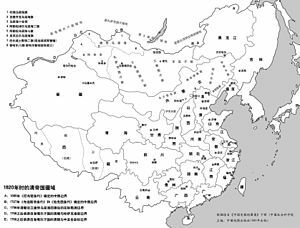 1600—1840年中国国内生产总值的估算 (PDF). 2011年6月23日. （原始内容 (PDF)存档于2016年3月6日） （中文）. ^ 231.0 231.1 〈第六章：封建社会明清的经济〉. 《中國古代經濟簡史》. 复旦大学. 1982年: 第154–166頁. ^ 吴量恺. 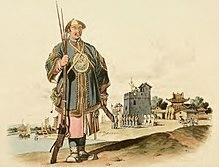 《清代经济史研究》. 华中师范大学出版社. 1991: 3–4. ISBN 9787562206972. ^ 翦伯赞. 《中国史纲要》第3册. 人民出版社. 1980年: 第270–271頁. ^ 沈德潜. 乾隆重修《元和县志》卷10：“（蘇州）城东之民多习机（织）业，机户名隶官籍。佣工之人，计日受值，各有常主。其无常主者，黎明立桥以待唤，缎工立花桥，纱工立广寺桥。又有以车纺丝者曰车匠，立濂溪坊，什百为群，粥后始散”. : 第7頁. ^ 243.0 243.1 243.2 第六章 〈封建社会明清的经济〉. 《中國古代經濟簡史》. 复旦大学. 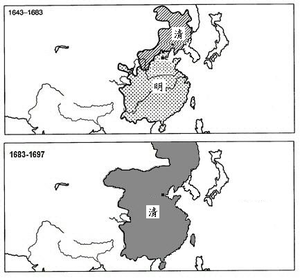 1982年: 第167–169頁. 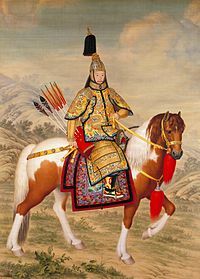 ^ 江苏省博物馆 (编). 《江苏省明清以来碑刻资料选集》：如苏州丝织业中的工匠“计工受值”，亦即“视货物之高下，人工之巧拙为增减”。在造纸业中，以刷蜡纸工为例，每日刷纸四刀为一工，如果一天多刷四刀，另加伙食工银五分。. : 第68页. ^ 江苏省博物馆 (编). 《江苏省明清以来碑刻资料选集》. : 第13页. ^ 248.0 248.1 248.2 248.3 248.4 248.5 248.6 248.7 第六章 〈封建社会明清的经济〉. 《中國古代經濟簡史》. 复旦大学. 1982年: 第174–177頁. ^ 249.0 249.1 史仲文. 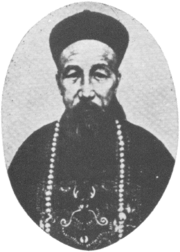 清代科技史. 《中國全史》 第087卷. 中國書籍出版社. 2014. 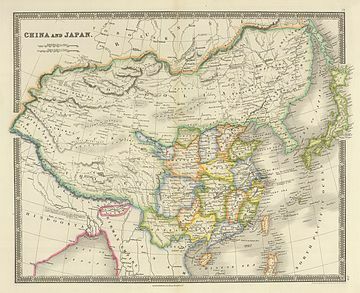 ^ DuHalde, Jean Baptiste, The General History of China: Containing a geographical, historical, chronological, political and physical description of the empire of China, Chinese-Tartary, Corea, and Thibet. 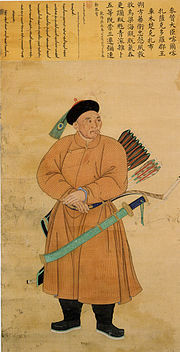 Including an exact and particular account of their customs, manners, ceremonies, religion, arts and sciences, University of Michigan, 1741 : "Their Ports under the Emperors of their own Nation were always shut up to foreigners, but since the Tartars are become master of China they have been open to all nations... The trade carried on within China is so great, that that of all Europe is not to be compared therewith..."
^ DuHalde, Jean Baptiste, The General History of China: Containing a geographical, historical, chronological, political and physical description of the empire of China, Chinese-Tartary, Corea, and Thibet. Including an exact and particular account of their customs, manners, ceremonies, religion, arts and sciences, University of Michigan, 1741 : "...the Provinces are like so many Kingdoms, which communicate to each other what they have peculiar to themselves, and this tends to the Preservation of Union, and makes Plenty reign in all the Cities. 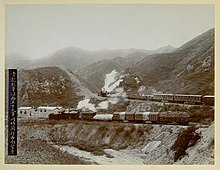 The Provinces of Hou quang and Kiang Si supply all the Provinces with Rice that are not well provided; the Province of Tcbe kiang furnishes the finest Silk; Kiang nan Varnish, Ink and curious Work of all forts; Yuan, Chensi, and Chan si yield iron, Copper, and several other Metals, Horses, Mules, Furs, etc. Fo kien has Sugar and the best Tea; Se tcbuen, Plants, Medicinal Herbs, Rhubarb, etc. and so of the rest; for it is not possible to describe exactly the articular Riches of every Province... 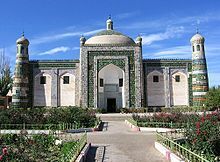 The Mandarins themselves have their Share in Business, and there are some among them who give their Mony to trusty Merchants to increase their Income in the way of Trade. In short there are none but the poorest Families, who but with a little Management can find means the subsist very easily by their trade. There are many families whose whole Stock does not amount to a crown, and yet the father and mother, with two or three children, and Maintained by the little trade that they carry on, get garment of silk of days of ceremony, and in a few years time enlarge their commerce to something considerable... In a word the most frequented fair is but a fair resemblance of the incredible crowds of people that are to be seen in the generality of cities, who either fell or buy all sorts of commodities. 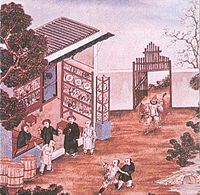 It were to be wished the Chinese Merchants were more honest in their dealings, especially when they trade with foreigners they always endeavor to fell as dear as they can often make no scruple of adulterating their commodities." ^ 257.0 257.1 257.2 257.3 257.4 257.5 257.6 257.7 傅樂成. 〈第二十八章：明清的宗教與學術〉. 《中國通史》. : 第727–729頁. ^ 258.00 258.01 258.02 258.03 258.04 258.05 258.06 258.07 258.08 258.09 258.10 258.11 鄭天挺. 〈第十四章：鴉片戰爭前清代的文化 第四節 哲學政治思想和宗教〉. 《清史》. : 第683–685頁. ^ 259.0 259.1 259.2 259.3 259.4 陳致平. 《中華通史（十二）》〈第七章 清代的民生社會 第二節 宗教信仰〉. : 第373–376頁. ^ 260.0 260.1 張羽新. 《清政府與喇嘛教》. : 第163–201頁. ^ 261.0 261.1 261.2 261.3 劉精誠. 〈第六章 明清道教的衰落 第二節：清王朝和道教〉. 《中國道教史》. : 第727–729頁. ^ 262.0 262.1 262.2 262.3 262.4 262.5 262.6 262.7 262.8 鄭天挺. 〈第十四章 鴉片戰爭前清代的文化 第四節 哲學思想和宗教〉. 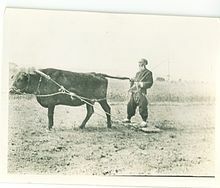 《清史》. : 第685–688頁. ^ 264.0 264.1 264.2 264.3 林瑞翰. 〈第六篇 第三章 宗教〉. 《中國通史》. : 第450–453頁. ^ 265.00 265.01 265.02 265.03 265.04 265.05 265.06 265.07 265.08 265.09 265.10 265.11 265.12 265.13 265.14 265.15 265.16 265.17 傅樂成. 〈第二十八章：明清的宗教與學術〉. 《中國通史》. : 第729–732頁. ^ 266.0 266.1 266.2 上海師範大學古籍整理研究所 (编). 《中國文化史大詞典》. : 第436頁. ^ 鄭欽仁、李明仁 編譯 (编). 《征服王朝論文集》. 台北: 稻香出版社. 1999年. ^ 姜小莉. 满族汉化与中华民族多元一体格局的形成. 《大连民族学院学报》. 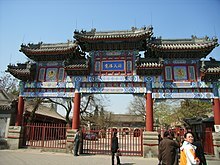 2007年, 第9卷 (2007年第04期) [2008-11-15]. ISSN 1009-315X （中文）. ^ ［英］John Barrow. Some Account of the Public Life, and a Selection from the Unpublished Writings, of the Earl of Macartney. London. 1807: 188–189. ^ 272.0 272.1 吳宏一. 〈序〉. 《清代文學批評論集》. ^ ［清］唐甄. 《潛書：附詩文錄》 （繁體版）. 台北: 中華書局. 2009. ISBN 9787101067033. ^ 286.0 286.1 286.2 286.3 姜公韜. 〈第七章：五百年社會文化的掠影〉. 《中國通史·明清史》. : 153–157. ^ 王奕清 等. 點校說明. 《欽定詞譜·上冊》. 學苑出版社. ^ 侯雅文. 《常州詞派構成與變遷析論》 (博士学位論文). 國立中央大學中國文學研究所. ^ 嵇哲. 《中國詩詞演進史》. : 298. ^ 301.0 301.1 301.2 姜公韜. 〈第七章：五百年社會文化的掠影〉. 《中國通史·明清史》. : 157–166. ^ 302.0 302.1 藝術與建築索引典—清. [2011年4月8日]. （原始内容存档于2011年11月17日）. ^ 吳量愷. 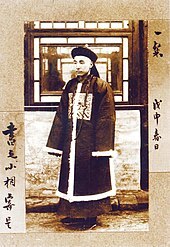 《清代經濟史研究》. 華中師範大學出版社. 1991年: 第15頁. ^ 307.0 307.1 307.2 南炳文、李小林、李晟文. 《清代文化——傳統的總結和中西大交流的發展》. 天津古籍出版社. : 246–255. ^ 310.0 310.1 310.2 魏子孝、聶莉芳. 〈第九章 清 第一節 清代 社會概況〉. 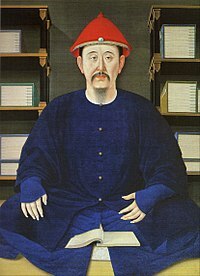 《中醫中藥史》. : 第729–732頁. ^ 李健祥. 《清末民初的物價與醫療》. Chinese Medical Journal. 2013: 123-128. doi:10.3966/101764462013122403009. ^ 312.0 312.1 312.2 戴逸. 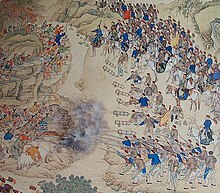 《簡明清史》（第二冊）. 中國人民大學出版社. 2006年. ^ Wakeman, Frederic, The Great Enterprise: The Manchu Reconstruction of Imperial Order in Seventeenth-Century China, Berkeley, Los Angeles, and London: University of California Press, 1985, ISBN 0-520-04804-0. In two volumes. ^ 13.0 13.1 邱捷. 清朝前中期的民间火器. 《社会科学研究》. 2012, (2).